just for their flowers. They are renowned forbeing a tough, easy-care plant with ornamentalleaves and few pest or disease problems. Tibouchinas hail from the subtropicalsouth-east of Brazil. Some older gardenerswill know them by their old botanical name,Lasiandra, or even as glory bush. The mostcommon species is Tibouchina granulosa, asmall evergreen tree that grows to 10m andis often planted as a street tree. Like mosttibouchinas, it flowers from late summer toearly winter, although in warmer areas thiscan extend to spring. There are also lesscommon species, such as T. mutabilis, whichflower in spring and early summer. Although some lesser-known tibouchinasare pink and white, most of the varietiestraditionally available to gardeners have hadpurple flowers. This is because they were themost common varieties and, as it is so difficultto propagate tibouchinas by seed, they wereonly propagated by cuttings. Hence, the colourhas remained essentially the same. There have been a few cultivars developedin the past, which have become firm gardenfavourites. T. lepidota ‘Alstonville’ is one ofthe most loved, growing to about 4m tall andbearing striking iridescent purple flowers.Smaller-growing cultivars, such as ‘Jules’and ‘Jazzie’, grow to no more than 1m tall. perseverance of innovative Australian plantbreeder Terry Keogh, there are new varietiesavailable in different colours and heights, andwith cold tolerance and extended flowering.This is great news for gardeners everywhere. Terry Keogh has worked in the horticulturalindustry for decades. Starting out in a Brisbaneretail nursery, he became frustrated by peopleasking if tibouchinas came in colours otherthan purple. So, when he started his ownwholesale nursery, he embarked on a missionto breed tibouchinas in new colours and sizes,and with more compact growth habits. The first problem was mastering the releaseof the pollen from the flowers. 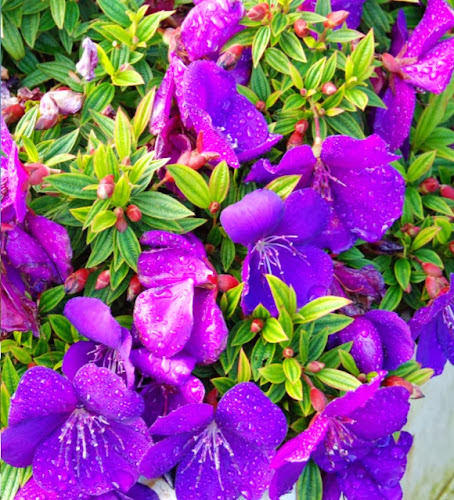 In its naturalhabitat, the tibouchina is pollinated byhummingbirds, the fast beating of their wingsresonating at just the right frequency torelease the pollen. Terry had to work out a wayto replicate this, and how he did it is a secrethe guards closely. He persisted for nearly twodecades, sometimes thinking he had exhaustedall possibilities before discovering a newavenue to pursue. Eventually, after endlesscrossings of many seed-raised varieties,Terry’s dedication paid off, resulting in one ofAustralia’s greatest plant breeding programs. box, page 24). The five cultivars all flowerprofusely, peaking in November and continuingthrough the warmer months. They featurelarge blooms in different colours and sizes.